When the world shakes and goes dark from the sun, moon and stars failing and the atmosphere rolls back like a scroll and Jesus calls the church up to Himself, those raptured up will not just be going to heaven (Matthew 24:29-31, Luke 21:25-28). There is a special celebration event planned called the Marriage Banquet (or Marriage Supper) of the Lamb and it will be glorious. In the study of ancient Jewish wedding customs, we find many similarities to the coming of Jesus Christ for His bride, the church. From the selection of each individual unto salvation by the Lord (becoming a part of His Church) to someday attending the Marriage Banquet of the Lamb, the body of Christ, His church is very much like a bride. Selection of the Bride: She is chosen (John 15:16). Wedding Agreement (Ketubah): The bride is offered a cup of wine for her acceptance from the groom and his father (Matthew 26:27-28, Luke 22:20). Bride has the right of refusal: She does not have to accept the offer of the wine and the marriage offer would be off. Bride Price: The groom offers the best price he can and it must be in keeping with the father's stature. 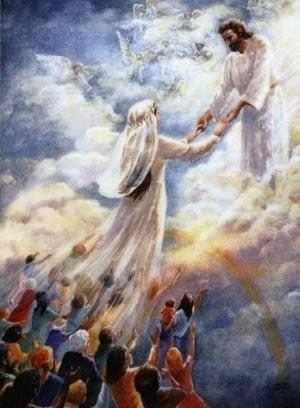 The bride of Christ has been bought with the most expensive price possible (1 Corinthians 6:19-20, 1 Peter 1:18-19). Staying Faithful: As his bride, she honors the covenant and the price he paid. Both the groom and bride are in a covenant relationship and stay faithful to one another and the groom provides provision for his betrothed (1 Corinthians 11:25-26). The Groom: He must prepare a new home for their future. This home must meet the approval of the father. It has to be up to the the standard of his name and honor (John 14:2-3). Marriage Mikvah or Baptism: The bride is immersed as a symbol of the covenant (Mark 15:15-16, 1 Corinthians 12:13). Call for the Wedding: The father of the groom decides when the wedding will be. He decides when his criteria is met to his standards. People know the wedding time is near and anticipate it, finally the father sets the preparation in motion and when he gives the word, the son goes and gets his bride. The Wedding: It is more of a celebration. There is a short ceremony, the consummation of the marriage and a banquet is given. The Marriage Banquet: The groom and bride have the second cup of wine together. It is called the simcha (Matthew 26:29). Everyone gathers for a time of joy, feasting and celebration. There are many other details and aspects about ancient Jewish weddings; not all are type and shadow of the relationship of Christ and His bride, the church. But certainly much of what is listed above seems to have a strong resemblance. For more information on this subject, see the article, Ancient Jewish Wedding Customs and Jesus Christ, His Bride, the Church. Let's look at some of the Scripture's that refer or allude to the church or God's people as a bride or the bride of Christ. Some also refer or allude to the Lord as the Bridegroom. Additionally, in each of the entire books of Ruth, Esther, Song of Solomon and Hosea are founds types and shadows of betrothal, failure of betrothal, redemption with tremendous symbolism of the love and mercy of God in the sense of marital relationship. Even in the sense that Adam and Eve were the first parents in the natural, Jesus is the “second Adam" (1 Corinthians 15:45-49). And the church is like unto His wife, which through her, He is given more children who then become more family. With the understanding that the body of Christ is His bride, let's take a look at the verses about the Marriage Supper of the Lamb, with the preceding and following verses for a deeper understanding. Please keep in mind, that chapter and verse markers were added to the Bible. At the close of chapter 18 of the book of Revelation, is the destruction of “great city of Babylon” and how the people of earth reacted to her demise and information as to what went on there. As chapter 19 opens, we see the reaction to “the destruction of the harlot” in heaven. Revelation 18:21-24 “Thus with violence the great city Babylon shall be thrown down, and shall not be found anymore. The sound of harpists, musicians, flutists, and trumpeters shall not be heard in you anymore. No craftsman of any craft shall be found in you anymore, and the sound of a millstone shall not be heard in you anymore. The light of a lamp shall not shine in you anymore, and the voice of bridegroom and bride shall not be heard in you anymore. For your merchants were the great men of the earth, for by your sorcery all the nations were deceived. And in her was found the blood of prophets and saints, and of all who were slain on the earth." Then the sound of a huge multitude (like the sound of many waters – waters represents people) would certainly seem to be the redeemed of the earth who will have arrived from the rapture and is confirmed with the verses that follow. Revelation 19:5-10 “Then a voice came from the throne, saying, "Praise our God, all you His servants and those who fear Him, both small and great!" And I heard, as it were, the voice of a great multitude, as the sound of many waters and as the sound of mighty thunderings, saying, "Alleluia! For the Lord God Omnipotent reigns! Let us be glad and rejoice and give Him glory, for the marriage of the Lamb has come, and His wife has made herself ready." And to her it was granted to be arrayed in fine linen, clean and bright, for the fine linen is the righteous acts of the saints. Then he said to me, "Write: 'Blessed are those who are called to the marriage supper of the Lamb!'" And he said to me, "These are the true sayings of God." And I fell at his feet to worship him. But he said to me, "See that you do not do that! I am your fellow servant, and of your brethren who have the testimony of Jesus. Worship God! For the testimony of Jesus is the spirit of prophecy." In the timeline of future events, it would seem that by the placement of verses in conjunction with other Scripture, that when the rapture happens and the saints (born-again believers) arrive in heaven, it will be a glorious event! And not long after their arrival, will be the Marriage Supper of the Lamb. It is quite possible, that the harlot, Babylon, the great city of the wicked, is destroyed right after the 144,000 Jews, 12,000 from each tribe are safely out of there and sealed for the last 3 ½ years (Revelation 18:4, Revelation 7:1-3, Matthew 24:15-21). The trumpets and bowls of God's judgment and wrath are reserved for the wicked left after the rapture. For those that would believe that the rapture happens at the last trump of the seven, please see the article called, The Last Trumpet. It is our belief that the last trumpet of this Age that calls the saints up, is not the same as "last one" of the seven. Not all the trumpets in the Bible are the same. When the rapture is complete and the 144,000 Jews are securely sealed, it would seem that soon thereafter will be the demise of Babylon's great harlot city. In the following verses, we see that the Lord puts its destruction in the hearts of the wicked to fulfill His plans. Revelation 17:15-18 "Then he said to me, "The waters which you saw, where the harlot sits, are peoples, multitudes, nations, and tongues. And the ten horns which you saw on the beast, these will hate the harlot, make her desolate and naked, eat her flesh and burn her with fire. For God has put it into their hearts to fulfill His purpose, to be of one mind, and to give their kingdom to the beast, until the words of God are fulfilled. And the woman whom you saw is that great city which reigns over the kings of the earth."" The saints will arrive in heaven full of overwhelming joy, giving God glory and there will be a time of huge praise and celebration. In God's timing, sometime after the Lord's glorious return with His people to heaven, will come the Marriage Banquet of the Lamb. By Scripture and even simple logic, it must happen between the Rapture and the Battle of Armageddon. In Revelation 19:11-21, the Marriage Banquet concludes with the Lord going to earth and defeating the enemy at the Battle of Armageddon. Also, with Scripture and logic, we can see that the Battle of Armageddon will precede the Second Coming of the Lord with His saints when He returns to set up a special Kingdom on this earth for a special Millennium. This final Millennium will be the last one for the current earth, and after the time of testing, which will follow its conclusion, the old heavens (universe) and earth will be destroyed. There will also be the judgment of the wicked at the Great White Throne of Judgment and finally a new heaven and earth with the Holy City that Jesus has prepared for us, will come down from the heaven of God, onto the new earth (Revelation 21:1-3). The Marriage Banquet of the Lamb is not just a banquet. It is the heavenly equivalent to a Jewish wedding banquet. The Lord made it clear when He left, that He was going to prepare a place for us and return to get us some day so that we could live with Him there. And when the Father says the time is right, He will send His Son to go get His bride. And also when the time is right, we will all take the glass of wine with Jesus that He spoke the night before the crucifixion.